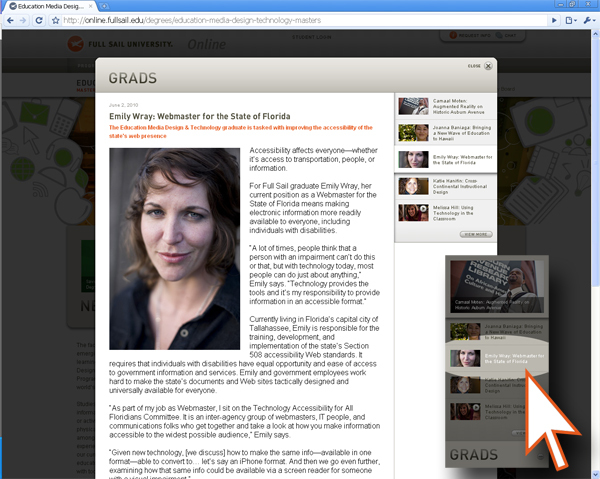 I was recently profiled as a featured graduate of Full Sail's Education Media Design and Technology Master's Program. A few months back I was interviewed for winning 3rd place in the international Udutu Guru design contest. This time, it's all about accessibility. Accessibility affects everyone—whether it’s access to transportation, people, or information. For Full Sail graduate Emily Wray, her current position as a Webmaster for the State of Florida means making electronic information more readily available to everyone, including individuals with disabilities.